When I last left you, we were speeding away from Villa Feltrinelli, out into the glittering sunset. Veil blowing in the wind, watching the light dance upon the water. In the very best company. Looked after by the most diligent of bridesmaids. Meanwhile for our guests the party was already in full swing. They had already ventured out to the venue, along with the groom. Stepping off the boat onto the magical Island of Lake Garda, a place I’d fallen in love with years ago and couldn’t wait to share! They had roamed the gardens, lush with blossoming roses, buxom hydrangeas, exploding bougainvillea and avenues of fragrant citrus trees. They left the shores of the lake, with its gently lapping waves and happily bobbing ducks, to make their way upto the Italian Gardens. For bellinis, spritzes, champagne and a spot of music. All looking incredibly suave in their black tie. While they broke the ice, we sailed on. The ceremony space waiting patiently to be filled. Beneath a ceiling of crumbling Italian frescos, Nikki Tibbles created a wonderland. My brief was that I wanted to feel as though the fabulous gardens below had crept into the space, refusing to stay where they should be. She couldn’t possibly have created something more wonderful. The most beautiful mixture of local flowers & those I remember most fondly from my childhood. A few even crept onto the pews. Scented candles burned all around, mingling with the smell of the garden, the flowers and the cool evening breeze dancing in from the lake. At the groom’s request guests were asked to leave cameras & phones at home (partly for his own privacy and loathing of social media but mostly for the privacy of his friends), clever Nikki set up the most fabulous photobooth nonetheless. A backdrop of blooms married with those already growing in the garden, for those who couldn’t resist a snap together in their finery. While the groom and the guests sipped on their cocktails, a boat full of very excited girls pulled into the dock below. I cannot tell you how excited I was to get there. I had expected to be nervous but instead was completely overcome with joy, and desperate to join the fun! We followed the avenue of candles in golden storm lanterns, right into the heart of the island. Enjoyed one last toast as a single woman, with my hero. And as the sky turned the most delicate shade of pink, I made my way to the alter. I walked through a collection of my closest friends, my family and my new family, all beaming at me and whispering hello. I clutched my father’s arm and walked slowly towards my future, waiting for me there at the end of the aisle with tears running into his smile. Daddy gave me away, shook my husband-to-be’s hand and took his seat, next to the woman he’d done all of this with all of those years before. Roger Saul, a friend I’ve known since I was 3 and one of the happiest married people I know, did us the great honour of marrying us. He managed the tricky balance of deep and meaningful, solemn and light heartedness. Much to all of our delight. I have always thought that a wedding should be as much about the guests as it is about you. Lots of good food and drink goes without saying, but I wanted everyone to be able to take something from the ceremony. I think the best weddings are ones where couples end up squeezing each other’s hands, nestling into them a little further and going away feeling renewed in their commitment to one & other. This was reflected in our readings. Julia shared her wisdom on married life. Mum read a piece she had been saving since before I was born. A recipe called Bride’s Cake from a 1920’s cookery book. It’s safe to say there wasn’t a dry eye in the house! And finally Harry shared advice from someone very dear to us, who couldn’t be there. What I Learned About Love, I Learned From My Dog. Finally, it was time to make our vows. loving what I know of you and trusting who you will become. I will respect and honor you always and in all ways. Remember tonight for it is the beginning of always. With you I pledge to repair one small piece of the world. To love and to cherish from this day forward, in this world and the next. To you and to the One who gave you to me today. And then my best friend for all of those years, Mr PJ van Sandwijk kissed his bride, and became my husband! With the formalities taken care of, it was time to celebrate! There were many congratulations to be told. A few more tears to be shed and many a hug to be had. Before descending into the gardens for drinks and nibbles. 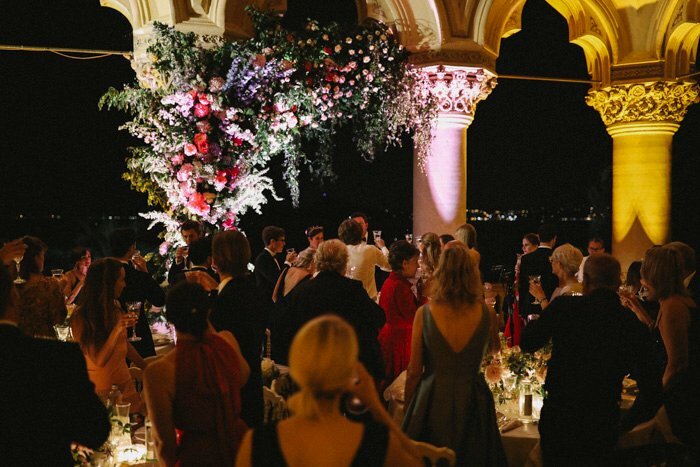 Guests sipped on cocktails as waiters circled with trays of Italian classics, Sicilian red prawns, seared tuna with pistachio, meats, cheeses, pastries, sandwiches, arancini, my personal favourite – fried sage leaves. You know me, noone was going to go hungry at my wedding! The caterers, Padovani Benuzzi completely out-did themselves, everyone I’ve seen since the wedding has exclaimed that the dinner was one of the best they’ve had in Italy. Which is not easy to do for a crowd! But more on the food later, some of us were far too excited to even think about eating! The next two hours flew by at light speed. I was far too busy chatting to friends, thanking guests, and sipping cocktails to even notice that my husband was nowhere to be found. It seems he was doing the same at the other end of the garden, with the other half of the congregation! One of the reasons I wanted a small wedding, other than the venue not being able to hold more, was that all I had heard from recently married friends was that they didn’t get to see enough of the guests. That they never really got one-on-one time with anyone, which seemed a shame seeing as I finally had a reason to get all of my loved ones together at last. So very early on we made a commitment to only invite 80 guests, and we both had to have seen them within the last year. It worked perfectly as I got a little time with absolutely everyone, and a deviously designed seating plan meant that each and every guest left the island with at least one new friend. And I selfishly got to spend time with some of my older ones. While we were gallivanting, my incredible wedding co-ordinator Silvia and her team were working away behind the scenes. And before we knew it, Harry – our master of ceremonies, led us to dinner. Our ceremony space had been transformed, as though by magic, into the most beautiful of restaurants. Overlooking the lake and stars twinkling into life. Nikki and her team dressed the tables with hedgerow favourites, scented roses, sweet peas and creeping tendrils of passion flower. All surrounding Aerin Amber Musk candles. Vintage silver napkin rings held linen napkins, and a different flower for each guest. Climbing roses crept up chairs. And menus I designed to look like old botanical prints, denoted your place at each table. A pretty keepsake for anyone who wanted a memento. No sooner had you finished your plate of spectacular risotto than an Italian waiter in a dickie bow would appear at your shoulder, steaming tray of risotto in hand, asking if you’d like more! I so wish I could go back and do it all over again. And in a looser dress this time! Between each course we had speeches. Dad managed the perfect balance of heart-felt and funny, with the entire crowd hanging on his every word. Dinner sped by in a haze of happy chatter and a medley of different wines to be tasted. Thomas gave the most heartfelt speech you could imagine. And made many a friend along the way. My husband gave a speech that had every guest in tears, followed by a standing ovation. And at midnight precisely we led everyone down through the woods, to the water’s edge for a small, very light dessert after such a sumptuous meal. Yes, the traditional Italian wedding cake just so happens to be my favourite cake. Do you even have to ask why we chose there to get married?! We cut the cake to rapturous applause from our generous guests. And it was taken away to be served with fresh berries and steaming cups of espresso. We crossed a little bridge to the dancefloor in the woods, and had our first dance as husband and wife. Before being joined by the rest of the guests, eager to dance the night away. Sometime in the early hours I changed into something a little less formal. And we put our dancing shoes to work! Between boogies guests could wander back over the bridge for another slice of cake, a cuppa or just a breather. But no-one could stay away for long. My favourite DJ, Hugo Heathcote, joined us from London and has the unique talent of being able to cater for every guest, generation and vibe going. He reads a room like no-one else and seamlessly blends old school hip-hop with Motown, vintage classics with current hits. We quite simply had a ball. We headed home, cutting through the calm surface of the lake, just as the sun started to rise. Stretched out on the back of the boat, wearing someone else’s dinner jacket, I fell asleep with my head on my husband’s shoulder and counted my lucky stars.